The moment we saw this dress, we fell in love - and it only got better when the bride wore it herself. While the bride got hair and makeup done, this gorgeous Vera Wang gown hung on its hook, gently swaying in the breeze from outside. With a corset top that flows into a tulle skirt, this wedding dress is a true beauty. Every bride always manages to find a gown that perfectly matches her personality and complements her body, and this was no exception! 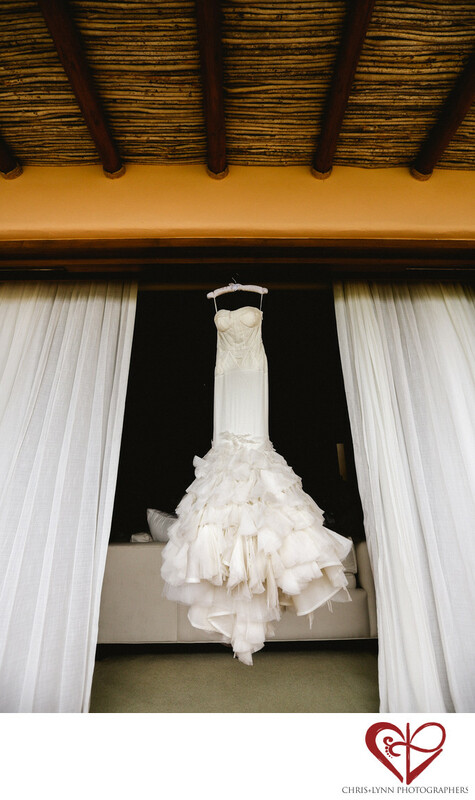 In this photo, we captured the gown outlined by the billowing white drapes that separated the suite from the patio. This suite was perfect for getting ready because it opened up to a beautiful patio with a palo de arco palapa, letting in fresh air. The clean white of the wedding gown stands out against the backdrop of the photo. Hanging in this spot, the entire bridal party was able to admire the gorgeous designer gown. We love to capture the wedding dress as it hangs before the bride slips into it. 1/1250; f/4.0; ISO 400; 16.0 mm.